2019 monthly sewer user fees remain unchanged from 2018 at $45.00 for metered pumps and $42.50 for self-powered pumps. At the end of each quarter (March, June, September, and December), property owners will be billed for the ending quarter’s sewer user fees, and payment is due by the 15th of the following month. Payments may be made in person, by mail, or by drop box located at the Boaz Community Building. Customers also may pay annually, semi-annually, bi-monthly, or monthly at no additional charge, as long as payments are made on time. If a quarterly payment is late, a 1% (one percent) late fee may apply. Per Wisconsin Statutes, any sewer services received from October-September that remain unpaid as of November 15th will be added as a delinquent charge to the property tax bill (including late fees and an additional ten percent penalty). The Boaz Sewer Utility uses a grinder pump system. 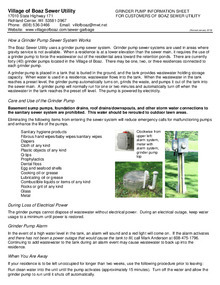 Information about the grinder pump system is provided below. 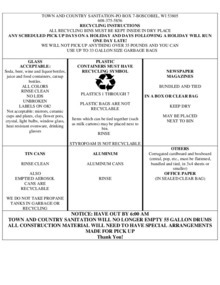 Download "Grinder Pump Info Sheet.pdf"
The Town and Country Sanitation schedule for 2019 pickup and recycling instructions are provided below. Additional information may be found by visiting their website at https://www.townandcountrysanitation.com.